Founded in 1986, Feudi di San Gregorio is located in the tiny village of Sorbo Serpico near Mount Vesuvius in Campania, Italy. I'm reviewing two of their wines. The first was their 2015 Aglianico. 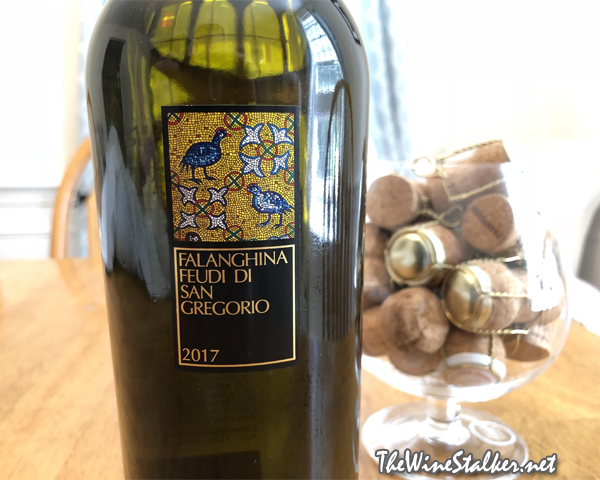 The second, which your reading right now, is their 2017 Falanghina and it's my Wine Pick for the month of August! This is 100% Falanghina from the Sannio Falaghina DOC of Campania. The grapes were hand harvested and delivered to the winery in refrigerated trucks, then hand selected and soft-pressed. The juice sees a cold settling for twenty-four to forty-eight hours at 58°F, cold-fermented in stainless steel vats between 61°F to 64°F, and is denied malolactic fermentation. Then it spends five months in stainless steel on the lees, and one month resting in the bottle. The color of the wine is a light pale yellow with a greenish hue. There's aromas of apples, pear juice, white blossoms, and sticky tree sap. It's medium bodied with a rounded and lush mouthfeel that creates a beautiful balance with the wine's brilliant acidity. The flavors are both massive and complex with all sorts of fruit; lemons, apples, pears, melons, oranges, and a drop of candied pineapple lollipop. Then it finishes with tart lemon and succulent orange. It's so happy and bright and wonderful, how could you not enjoy it right from the first sip? This is just one of those white wines that was made to make you smile and forget your worries. And I'm thinking that this with fried fish n' chips would be AMAZING!